The James D. Julia auction house, in Maine of all places, is claiming an 1860 Army revolver they have for auction came through a “direct descendant of the James family.” The descendant is not identified. Some of the James family have lived in New England since the 1880s. 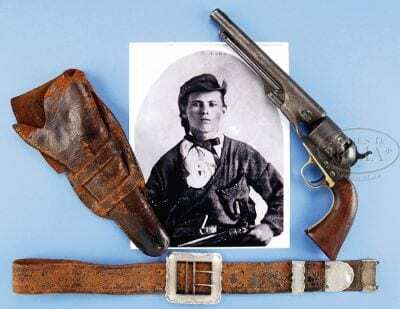 The auction house does not identify the provenance for its claim that Jesse might have used an Army revolver. Frank & Jesse James already had a clear preference in guns. They used the Colt Navy revolver. Upon his death, Jesse’s guns went to his wife and son, then to his grandchildren, who then donated them to James Farm & Museum. There’s been a clear and unmistakable chain of custody and provenance. The father of Charles D. Schmelzer, a German born manufacturer who owned the Schmelzer Fire Arms Company, worked at the Colt armory in Hartford, Connecticut. The family company was located next door to T. M. James & Co. the store in Kansas City of Jesse’s uncle, Thomas Martin James. Charles D. Schmelzer himself served with T. M.’s son, Luther Tillman James, on the Kansas City Board of Education. Schmelzer’s immigrant father had sold fire arms in the Far West, through Kansas and Nebraska and all the way to Colorado, as he stood at trading posts beside stacks of buffalo skins, waiting to be shipped to New York. I’ve submitted an inquiry to James D. Julia, and am waiting on a response of the gun’s provenance and the auction’s claims. I’m not holding my breath.